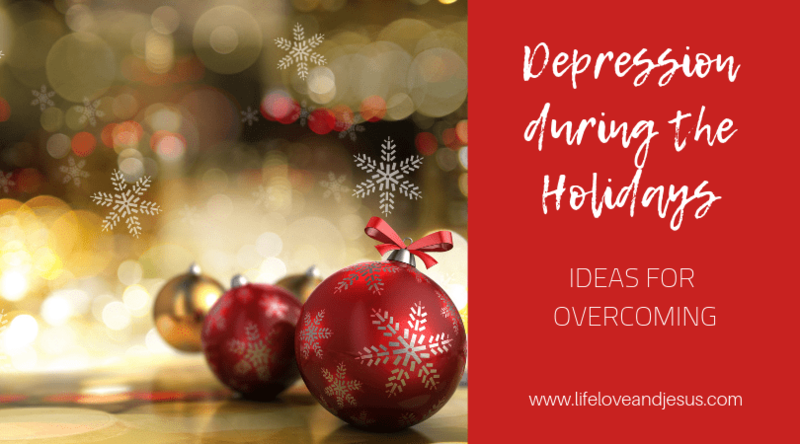 It is unfortunate, but true, that many people struggle with depression at the holidays. Unrealistic expectations, family conflicts, pressure to conform for appearance’s sake, and the crazy-hectic schedules all conspire to work against the balance we seek. However, these pressures can weigh more heavily on those who battle depression and anxiety on a regular basis. It’s as if our mental pictures of how life should be go into overdrive and drown out all our attempts to view the ups and downs of life realistically. When we find that our life doesn’t measure up to a Hallmark Christmas movie our emotions take a nosedive. If you are one of the millions of people who face this challenge, there are some steps you can take to help you handle your emotions in a more positive manner. I have written an entire book, as well as several posts, about living with chronic depression. I have been successful in winning victories – but I still struggle at times. That is human. Perfection in our emotions, like in the rest of life, is unrealistic. First, know that these suggestions are just that – suggestions. You don’t have to do any of them. These are just things that I have learned help me to cope and that I think might help you. Second, know that even if all of these suggestions sound good to you, you do not have to use them all. Pick and choose what you think will be most helpful. Don’t overwhelm yourself trying to do everything. Maintain as much normalcy in your life as possible. Keep your regular exercise schedule, your regular sleeping schedule. Keep up with your regular devotional time, your family dinner times, and your bedtime-reading-to-the-kids time. Don’t let the ‘need’ to do all-the-things disrupt your entire world. This also means maintaining your regular medicine schedule – don’t forget in your busy-ness to keep up with your meds! Along with the first suggestion, be choosy about what you do for the holidays. You should not expect yourself to do everything: Advent calendars, Christmas cards, matching outfits for pictures, parties, caroling, shopping, over-the-top decorating, and a never-ending supply of goodies to make can overwhelm anyone. Be mindful about choosing what you and your family will participate in. What you choose will most likely change from year to year as your family grows and changes. That’s okay! Deep-six the need for keeping sugary goodies on hand at all times. Make sugar cookies – using cookie cutters and decorating them – with the kids or grandkids once or twice. But share the cookies with everyone. That way you’ll avoid the temptation to eat them all and hopefully avoid the holiday weight gain. Do you always make divinity, muddy buddies, sugar cookies, and homemade fudge? Choose one as your traditional treat, and let the others go. It eases the schedule and pressure as well as limits the calories available. Set a limit on presents. Decide who you will give presents to – it doesn’t need to be everyone! My husband’s family draws names for gifts, but we stopped participating several years ago. It seemed as if we mostly got gift cards anyway. We still keep in touch (they don’t live close), but don’t participate in gift exchanges. My family stopped doing gift exchanges more recently as well. As my sister-in-law put it: we just get each other stuff we don’t need! Why bother? Again, we keep in touch other ways. Our gift-giving now centers on the grandchildren and our own two sons and daughters-in-law. It has cut down on the stress and the eased the strain on the budget. Along with limiting presents for adults, be extra-choosy when purchasing presents for children or grandchildren. I’ve done a post on this, so I won’t rehash it here, just know that limiting what you buy decreases the stress on yourself and usually increases the joy for the children. Focus on making memories, not accumulating stuff. Memories -especially ones captured in pictures – not only bring joy to your life immediately. They also bring joy when reviewing the photo albums or photo books you create. I have started a tradition of making a photo book through an online service every year. I have a tangible reminder of the year just past that I can review whenever the mood strikes. It brings back the joy of past years. I do this in the week between Christmas and New Year’s Day and have the book to share with others by the second week of the new year. I always finish the book the first week of the year, so that any special events for Christmas and New Year’s Eve get in the book. Finally, as I say at the very beginning of my book, measure success in small steps. Got through the office party without too much angst? Success! Attended all the kids’ Christmas programs and actually enjoyed them? Success! Finished the (limited) Christmas shopping before our self-imposed deadline? Success! Didn’t gain any holiday weight? Success! Limited your holiday weight gain to only 2 pounds when you usually gain 10? Success! Find success where you can and enjoy it. Enjoy it even more by sharing your successes with friends and family. 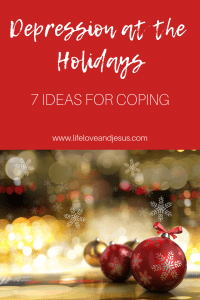 Perhaps you will find yourself struggling with depression or anxiety after the rush of the holidays is over. Or even in what should be happier times of your life. If that is so, I encourage you to seek help from friends, family, or professionals. If your depression is not too serious – no thoughts of hurting yourself or others – you may be able to handle it on your own with family support. But maybe not. I have gone to counseling to deal with my depression in the past – three different times, in fact. And I’ve taken medication when necessary. Besides those two critical pieces, I’ve also learned many coping skills that I’ve made part of my life. 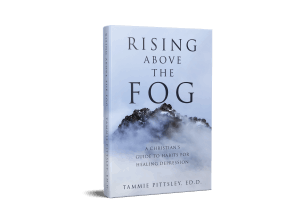 I’ve written about my story and my habits for handling my depression in detail in Rising Above the Fog, which is available only on Amazon right now. But it is available in both Kindle and paperback. If you struggle and need some practical guidance on how to be an overcomer, this book could help you. It includes 96 habits that can be helpful in finding victory. But it is work to overcome depression – this is not a quick-and-easy solution. Finally, I hope you can find joy in the holiday time. Joy in knowing the Jesus left His home in glory to come as a baby, live as a man, and die as a Savior all for love. Love for you, for me, for the entire world. Relish His love. Remember it when times are tough. Spend time in His word. Find joy in Him.